This week, let’s look at the biggest African-American character in the Aquaman comic, Black Manta. First appearing in “Aquaman” (vol. 1) #35 in 1967, Manta was created by Bob Haney and Nick Cardy. He’s since become the Sea King’s primary archfoe. What might make Black Manta unique is that he’s probably the most well-known Black supervillain in comics and among the general public. This is thanks to the character’s media appearances, particularly on “Super Friends,” my first exposure to him. I say “probably,” as Batman’s foe Killer Croc (who’s shown in flashbacks as African-American) might’ve eclipsed Manta’s fame by now. Black Manta’s main goals are to conquer or plunder Atlantis/the oceans for his own ends, and defeating his enemy Aquaman once and for all. His equipment includes his distinctive helmet/diving suit that can withstand the ocean depths. He also uses various high-tech weapons, gear and submarines. In many versions, his helmet’s visor is capable of emitting laser eye-blasts. Manta wasn’t revealed as being African-American (and was never seen without his helmet) until a late 70s storyline. Said storyline also revealed a supposed motivation to conquer the oceans so Blacks could colonize them, and be less oppressed than they were on land. This got him some followers, including minor Aquaman character Cal Durham. However, it turned out to be just a ruse to achieve his main goal, defeating Aquaman. After this plan went sour, Manta committed his most infamous crime, killing Aquaman’s infant son, Arthur Curry Jr. (“Aquababy”). This sent the Sea King into a rage, where he swore to bring Black Manta to justice. Of course, Manta would make recurring appearances up until this day. Manta’s origin story was never revealed until the 90s, when he gained the first of three possible (and conflicting) origin stories. The first origin story, from 1993, claims Manta as a kid loved to play by the sea, until he was captured and tortured on a ship. He supposedly saw Aquaman swimming by and tried to signal him for help, but failed to reach his attention. After freeing himself, Manta hated the sea, and vowed to become an enemy of all that’s in it, including Aquaman. The second origin story, from 2003, has Manta as an orphan who’s thrown into Gotham City’s Arkham Asylum for being autistic (?! ), and was restrained to his bed, due to the doctors not knowing how to treat autism. Manta was also fascinated by seeing Aquaman on TV. After experiments at Arkham left him with a “cleared head” (as Wikipedia puts it) but in a violent state, he escapes Arkham to, I assume, become the supervillain he is today. None of the above origins sound particularly appealing to me, as they all clearly reflect modern “grim and gritty” superhero comics writing. The second one, frankly, sounds somewhat offensive regarding autism. I’m also not sure how the first two fit into the post-Crisis DC Universe’s compressed timeline, as Aquaman’s career wouldn’t have stretched back into Manta’s childhood. 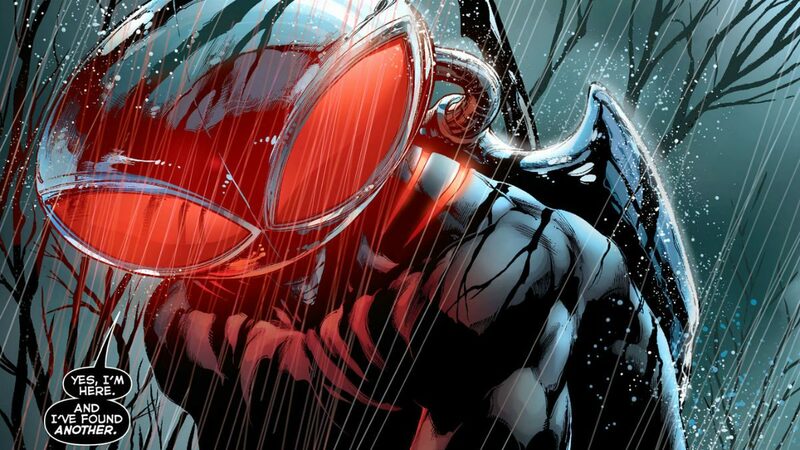 Black Manta is due to appear in the 2018 “Aquaman” theatrical film. Actor Yahya Abdul-Mateen II will play the villain.